The final chapter of the book examines the many meanings of the phrase, Never More Campesinos. It also takes a look at information about the most recent changes in the community in 2014 relayed to me via social media. In an unexpected turn, a charismatic man who recently returned to the community starts a cultural center in the middle of town and in 2012 was elected second Delegado. In the following video clip, listen to the dialog between a young man who works making clothes in the household of his campesino father. Here, the older man notes the monetary benefit of his son’s work, compared to his own agrarian pursuits. One of the most powerful changes in the community has been the coming of new possibilities in the life of women, despite having a cultural system structured to favor male dominance. Listen to this short talk by Susan Kellogg, “Studying Women’s (In)equality,” on the Aztec heritage of gender relations. As noted at this chapter’s beginning, in 2012 the plaza itself underwent a physical transformation. Ahead of elections to continue controlling Texcoco’s municipal government, the party then in power, PRI, had identical new plaza architecture installed in all of the mountain communities. As seen in the PowerPoint link below this includes not only a small garden area, public toilets, a play area for children with a “Spider Man” image, but also exercise equipment for seniors! Importantly, despite this politically motivated largesse, the PRI lost the Texcoco municipal elections in 2012. It is noteworthy that in 2008 an environmental cleanup project was among the earliest efforts by the Amanalco Pilhuame Ollin group when it began to organize around a modern indigenous identity. 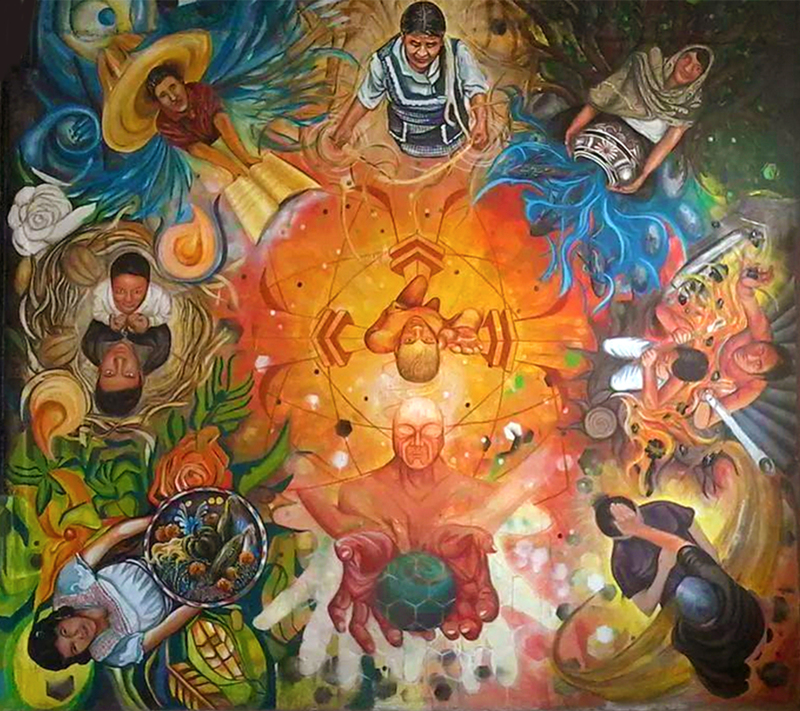 One can also see, in the PowerPoint below, this concern for the local environment in large a prominent “clean ecology” wall mural created during 2012 in a collaboration between the school system and Amanalco’s ecology committee. Within Amanalco itself, as the Pilhuame Olin group was fading, a new organization, Centro Cultural Miyotl (Rays of Hope Cultural Center), was being created in the center of town. It began slowly in late 2010 through the efforts of a charismatic 27-year-old man, Miguel Osorio (see the Miyotl Facebook page). Incredibly, by 2013 Miguel had been elected 2nd delegado and managed to convince 10 urban teachers to travel to the community and give free lessons in hair styling, various types of craft production, theater, taekwondo, guitar, and even English. The PowerPoint below begins with the Centro Cultural Miyotl banner hanging from the delegación building in Amanalco shows the wide variety of activities in the center. Added Value: The Community turns to its Youth and its Roots – Creating the Miyotl Mural and the Opening of the Amanalco’s Museum. After being refused monies many times by the state, to construct a Nahuatl Cultural Center at the entrance to the community in 2012 Amanalco with the leadership a charismatic young man developed a multi-purposed cultural Center in the central plaza. In 2014 he helps develop a local museum marked by the striking mural on this book’s cover and which includes historic photos, contemporary material culture and archaeological artifacts. See the two videos below detailing the process of creating the mural and the opening of Amanalco’s own museum. In March 2015, my wife, anthropologist Maria Vesperi and I made a promised return to Amanalco, to present the Indigenous Mexico book to the community, visit with our compadres and examine what has changed since our last visit in 2010. The video also shows the mural artist explaining the symbolic meaning of the mural and the director of the Miyotl Center talking about future hopes for the community.